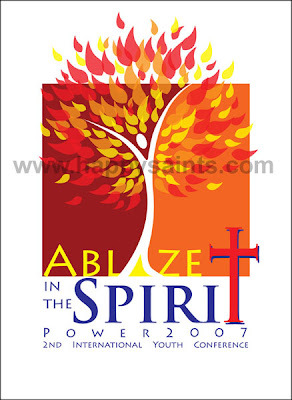 First in my logo showcase is for an International Youth Conference by Divine Retreat Centre in India. The logo literally adopts the theme ‘Ablaze in the Spirit’ by displaying a person wrapped in flames but yet not consumed by the fire. The person is stylized in the form of a burning bush, where the body is the trunk and the flames become leaves of the bush. It is a metaphor relating to the appearance of God to Moses where ‘there was the bush blazing, but the bush was not being burnt up’ (Exodus 3:2). Moms Can Be Saints Too!